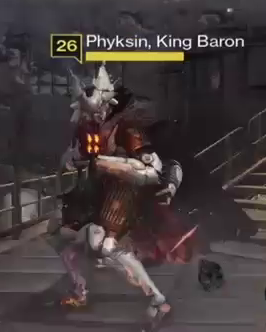 Physkin, King Baron is a Fallen Baron encountered in the Will of Crota Strike. As Omnigul tries to lose the players through the House of Kings' territory in the Terrestrial Complex, Physkin will spot and try to fight the Guardians, which ultimately led to their demise. Physkin is the second Kings Baron to appear in Destiny, the first being the Ultra Captain.